When marketers spend serious money, then the guys upstairs want to see some results. Until now people have experimented with low budgets and without very specific goals. The bigger budgets will bring a need to show return. Return on investment is very simple. You put something in – the investment. You get something out – the return. And the return should be higher than the investment. 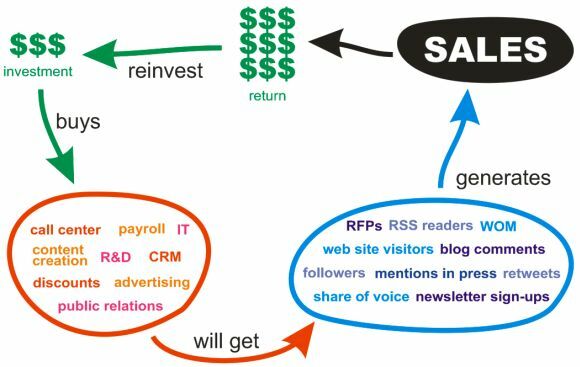 ROI = (return – investment) / investment. Some of these results are relevant to your business. Select the results that apply and set concrete goals what you want to achieve. Make sure that you note the existing levels of that metric so you can attribute the change to your activities. For instance, if you have 10,000 monthly visitors to the company website, then mark it down as a starting point. Now you have to find out how to tie these results to an actual monetary business value. How much money comes in because of your activities. For example, you may have 1,000 Facebook fans and get 100 visitors per month from your Facebook fan page. 25 of those visitors make a purchase that gives you 500 dollars of profit. Now you know that if the quality of fans is constant, each additional fan will generate 50 cents of profit per month. You could use up to 49 cents per month acquiring more fans through advertising or other activities and still have a positive ROI. Consistency, predictability and repeatability are important when dealing with ROI. Experiment with small budgets. Weed out money losers and channel the funds into profitable activities. As soon as you can show positive ROI, bosses will get really happy, invite you to dinner, pat you on the back, and give you a rise. Budgets will grow even more. 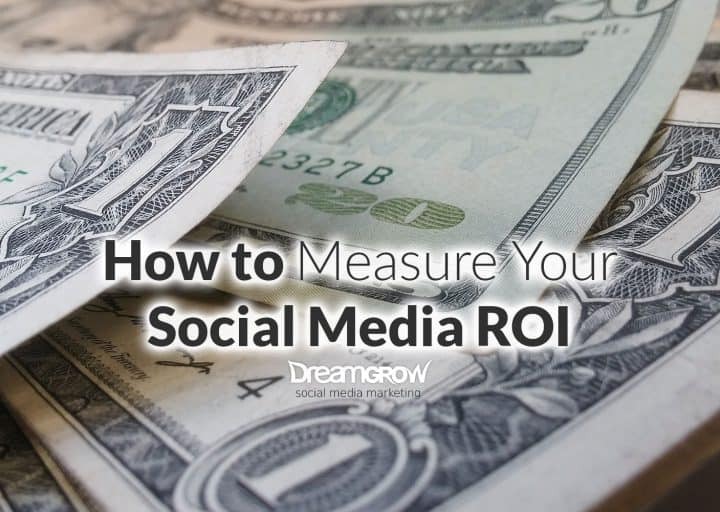 It’s clear that there’s no single easy way to measure social media ROI. However, combining several different methods may get you the results you need. The clear path exists for social media marketers who use social media in a direct selling way. It’s pretty straightforward to set up your web analytics tools to segment the visitors arriving from social media sites and then analyze if their behavior or conversion rates are different from other visitors. You can check out my posts about How to Tag Social Media Links for Google Analytics and Measuring Your Social Media Success with Google Analytics. The problem here is that not all marketing is direct and if you don’t have financial goals on your website, there’s no direct R or return on investment. These vague goals mean that you need to consider indirect metrics like leads from website, sales volume over campaign period and other tactics that may also be influenced by other marketing channels besides social media. If your website’s goal is a lead then you need to analyze which leads convert to sales and what were the referring channels. One indirect method to estimate social media marketing ROI is to measure brand metrics. The number of mentions, sentiment, the share of voice are a few indicators that can be measured quantitatively. Then you can correlate these numbers with sales figures. If sales and social brand metrics move in unison, then there’s a causal relationship. You can test that hypothesis by changing your social media marketing activities and measuring resulting changes in sales. Another simple solution would be to run social media test campaigns when there are no other marketing activities in the target market. If you see lift in results the you can attribute all that to your social media campaign. Isolating social media campaigns might not be possible so here are some other options to see the connection between social media marketing and financial results. To do that you might want to start from the other end of the sales funnel. Look at the people who have already purchased your products or services and try to determine how much social media channels influenced their decision. Segmenting your customers by different marketing touch-points will give you insights into the effect that your social media marketing activities have on your business. For example, we get a lot of feedback from new clients that they started to consider us after reading our blog posts that led to joining our newsletter and eventually becoming a paying customer. Look for ways to find out what channels influenced the purchasing decision and compare social media results with other channels. 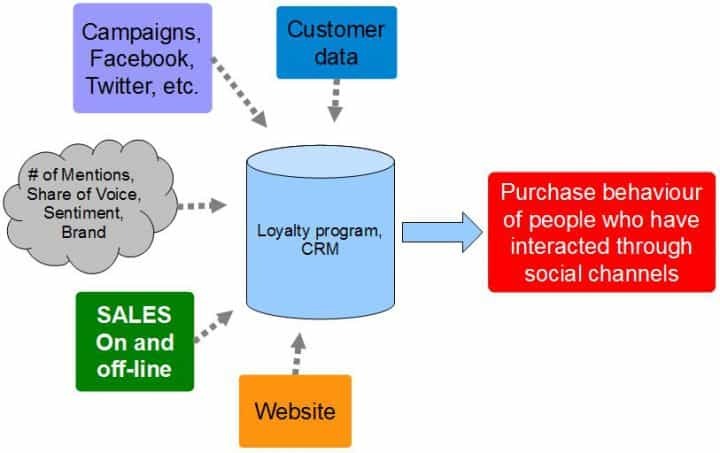 To reach the master level make connecting through social media a part of the loyalty programs. This way you can see how people who have indicated their social media connection behave differently from other groups. Create incentives for people to indicate their social media presence and connect with your brand. Next step from here would be a full-blown CRM system that includes social media interactions, purchase information and other key information about your customers. 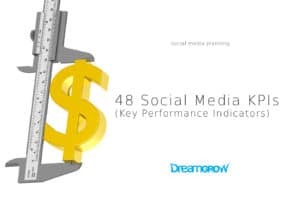 These metrics will make social media marketing ROI a real dollar value for your business, and you can also bridge the gap between on and offline interactions. This is how you get to social media ROI in sales. Similar techniques can be used to evaluate the value of employee retention, saving HR cost, money saved in development, etc. Of course, life is not that easy. It’s a mess, and this means that you need to combine some or all of these models to get to the bottom of your results. We will be posting more insights about measuring content marketing and social media ROI. Sign up for our social media and content marketing updates, and we’ll let you know. Social Media isn’t just for the Next Generation – it’s for every generation. Whether you’re an entrepreneur, a media professional, a college student or a mom, social media will shape your future. Don’t be overwhelmed by it; read Qualman’s book instead.” – Jane Wooldridge, The Miami Herald. How to Create Your Social Media Strategy? Get your strategy in place before you start. Here are easy to follow steps that help you give your social media strategy a solid foundation. Where is the Money in Social Media (ROI)? Recommended book: Social Media ROI: Managing and Measuring Social Media Efforts in Your Organization . Use this book to bring true business discipline to your social media program and align with your organization’s goals. Top branding and marketing expert Olivier Blanchard brings together new best practices for strategy, planning, execution, measurement, analysis, and optimization. You will learn how to define the financial and nonfinancial business impacts you are aiming for–and achieve them. Practical solutions from structuring programs to attracting followers, defining metrics to managing crises. This book will help you gain more value from every dime you invest in social media. Great article Priit, very useful information. I would like to add one interesting way to track the success and ROI of your marketing activities – You can use inbound numbers, like 1300 and 1800 numbers here in Australia ( https://www.iphub.com.au/ ), and through inbound call reports, see who responds to each of your campaigns as well as when, where, and how. Yeah! It’s very easy to calculate ROI. But I think yours formula is too much easy as it clarifies everything in detailed manner. Great strategy, keep it up! Very detailed thank you. Social media has so many little nuances to it that it is not always so straightforward to dtermine how to measure RoI, or even what are the right metrics to track for any particular campaign. So it’s true social media strategy is not yet dead. There are some use social networking for there business because they know how to use it and verify the results. thanks for the excellent post. It would be good to give credit to the “former coworker [who] writes her master thesis about using social media. Reference? Name?